Demosthenes is one of the most famous orators of ancient times, and many of his speeches were preserved and studied by students of rhetoric for hundreds of years. He lived some years after the Golden age of Athens in a period of decline, and constantly exhorted his fellow-citizens to return to their former habits of courage and self-reliance, but to little avail. His great nemesis was Philip II of Macedonia, who during the lifetime of Demosthenes was slowly becoming an over-lord of all of Greece using both military and diplomatic methods. Demosthenes warned against acquiescing to Philip, but failed to inspire his townsmen to act until it was too late. The story of Demosthenes evolution as an orator is especially notable because he was not a naturally talented or confident speaker as a youth, but rather, a relatively poor one. He gained his reputation mainly through hard work, and improved his speaking abilities by various methods such as shouting to be heard above the crashing of the ocean waves, and spending many hours in his studio preparing his speeches. He eventually became a prosperous lawyer and when Philip of Macedonia began involving himself in the affairs of Greece, he became increasingly involved in politics. In around 357 B.C. Athens became involved in a Social War with some of her colonies. At nearly the same time, the Sacred War broke out between Thebes and Phocis. Philip II used both of these conflicts to increase his influence over northern Greece and several of Athens' allies in the Aegean. Demosthenes saw the danger of Philip's designs early and began delivering speeches warning of the Macedonian threat, but many of his fellow-citizens were willing to make alliances with Philip in order to oppose Thebes and avoid going to war. Philip's encroachments and Demosthenes' warnings persisted for many years before the fatal Battle of Chaeronea, after which Athens submitted to an alliance under terms highly favorable to Macedonia. For the next twelve years, Demosthenes had no real choice but to submit to Macedonian rule, and only by the intervention of a well respected general was he spared permanent exile. On the death of Alexander in 323 B.C. however, he helped inspire a rebellion against Macedonia. When the rebellion was put down, he fled to a temple and there ended his own life. 384 BC Demosthenes is born in Athens. 364 BC Sues his guardians for mismanagement of his estate. Trained to become an orator and a lawyer. 356 BC Sacred War begins between Thebes and Phocis. 354 BC Began to be involved in politics. 351 BC Gave first 'Philippic' protesting Macedonian seizure of the Athens colony of Amphipolis. 346 BC Peace of Philocrates between Athens and Macedonia ends the Sacred War. 344 BC Presented Second 'Philippic'; traveled to Peloponnese to break up Philip's alliances. 343 BC Delivered Third 'Philippic', which tried to rouse the Athenians to resist Philip. 338 BC Athens and Thebes lose to Macedonia at the Battle of Chaeronea. 336 BC Death of Philip of Macedonia. 322 BC Involved in Greek rebellion against Macedonia, which was put down at the Battle of Crannon. 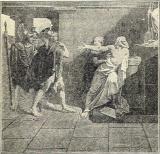 322 BC Suicide of Demosthenes. He left the assembly, hiding his face in his cloak. Aeschines Political rival of Demosthenes, who was a supporter of Philip of Macedonia.